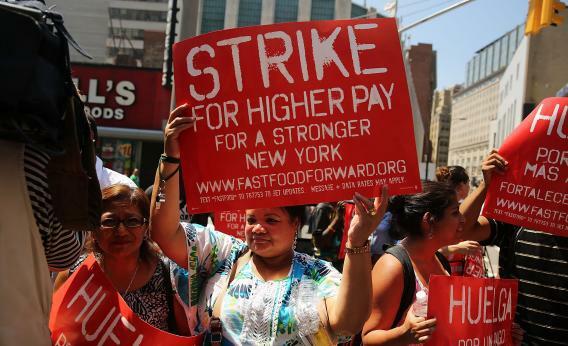 Fast food strikes: Low-wage female workers are driving this labor movement. Who’s Behind the Fast Food Strikes? Working Women. People of color make up 32 percent of the total American workforce but a disproportionate 42 percent of minimum-wage earners. And in the restaurant and fast-food industries, the majority of those workers are women of color—who, studies show, are paid 60 percent less than their male counterparts. Over 13 percent of food-industry workers rely on food stamps to feed their own families, almost double the rate of workers in other industries. Conservative politicians are always hammering on about how working class mothers, especially single mothers, need to pull themselves up by their bootstraps and fight for better lives for themselves and their families. Well, that’s exactly what they are doing. This is a labor movement that is structured largely around the needs articulated by the working mothers in it, women who, with or without a partner, are often trying to raise families on minimum wage jobs. Women make up two-thirds of the fast food work force, and a quarter of workers are raising children. The disturbingly low wages they get for this work make relying on public assistance to get by inevitable. In other words, the American taxpayer is bearing a huge chunk of the labor costs for wildly profitable companies like McDonald’s. These workers are trying to change that by shifting the burden from the taxpayer to their employers, by forcing their employers to pay a living wage. And it’s women that are leading the way.